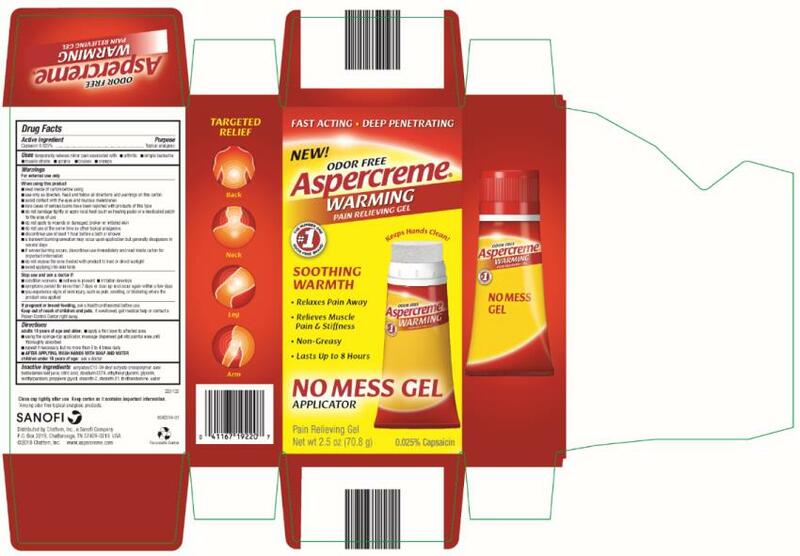 Proprietary Name: Aspercreme Warming No Mess What is the Proprietary Name? Aspercreme Warming No Mess with NDC 41167-1922 is a a human over the counter drug product labeled by Chattem, Inc.. The generic name of Aspercreme Warming No Mess is capsaicin. The product's dosage form is gel and is administered via topical form. Acrylates/C10-30 alkyl acrylate crosspolymer, aloe barbadensis leaf juice, citric acid, disodium EDTA, ethylhexylglycerin, glycerin, methylparaben, propylene glycol, steareth-2, steareth-21, triethanolamine, waterKeep carton as it contains important information.